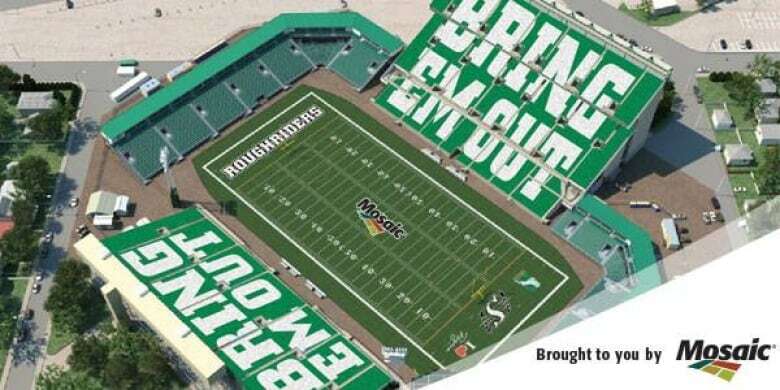 The Saskatchewan Roughriders are planning a special entrance for the Labour Day Classic. More than 30,000 fans are in their seats. A giant Canadian flag is pulled out on the turf. Anticipation and excitement builds along with the steadily increasing roar of football crazy fans. Smoke starts to emerge on the field, fireworks are shot off, flames are lit, the clock strikes zero, and it's time for one of the most exciting moments at Mosaic Stadium. "Bring em out, bring em out, bring em out, bring em out," is blasted over the speaker system as fireworks are blasted off and the Saskatchewan Roughriders run onto the field. It's a tradition done every week for the past several years. But this Sunday, the Riders are adding a new element for the Labour Day Classic. The team announced on Facebook it is hoping to create one of the largest card stunts in Canadian sports history. Fans on the east and west sidelines will find a special package at their seat. Together, all the cards will create a giant, 'Bring Em Out' visual. The 0-9 Riders are hoping to get their first win on Sunday against the 3-6 Winnipeg Blue Bombers. Kick off is at 2 p.m. CST. The Roughriders are looking for revenge after Winnipeg spoiled Saskatchewan's home opener with a 30-26 win in Regina. Saskatchewan hasn't lost to Winnipeg on Labour Day since 2004. The team announced on Thursday the game is officially sold out.